I am more than happy when i saw your mail.How was your day?,Mine is a little bitcold over here in Dakar Senegal. My name is Edith Godwill from Ivory Coast in\West Africa,and i am 22 years old 5.7ft tall, dark in complexion,(never married before) and presently i am residing in the refugee camp here in Dakar as a result of the civil war that was fought in my country. My late father Dr williams Godwill was the managing director of Godwill industry (Ltd) and he was the personal advicer to the former head of state (Late Dr Robert Guei) before the rebels attacked our house one early morning and killed my mother and my father in cold blood.It was only me that is alive now and I managed to make my way to a near by country Senegal where i am leaving now. mail.I will also like to see your picture. I have been directed by the director of Foreign Operation/Wire Transfer to write you in respect to your mail and your partner's mail which we received in our Bank. Actually,we have earlier been informed about you by the young lady Mis Edith Godwill (the next of kin) that she wishes you to be her trustee/representative for the claim of her late father's deposit with this Bank. 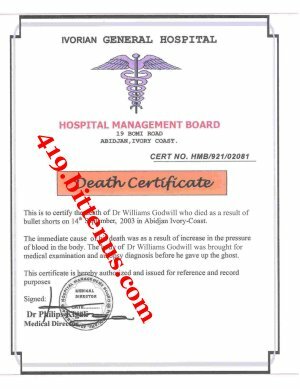 Late (Dr.Williams Godwill,) is our late customer with sum substantial amount of money he deposit with us, $6.5m Dollars. Six Million Five Hundred Thousand Dollars). Hence you have been really appointed as a trustee to represent the next of Kin. 3 A Certificate Deposit issued to him by our bank. Please i just got this news from the Bank, i will like you to try and see that you reply me and let me know what is going on and if you get it? How are you today? i hope fine.i am more than happy to read your mails and read what you got AS NEWS from the Bank, Once again thank's for your ability to help me transfer the money to your position pending my arrival to meet with you,it shows you are a dependable and trustworthy man. Listen, before i gave you this informations i saw your profile that you matched mine,i have never told any body about this money the only people that knows about it is you and me no one again knows about it (since my parent's are dead). So,i will also advise you to please keep it to yourself because i am afraid of loosing the money to people who will disappoint me when the money gets to there care that was why it took me time to tell you about it and i promise you this from my heart (I AM NOT GOING TO DISAPPOINT YOU) and i equally expect the same from you. Now,regarding the requests the bank needs from us i have with me here the last Deposit of Account (which i will send to you, if the lawyer agrees to help us) and the death certificate,(which i will also send to you) I thought it's the only thing the bank will need from us but since they need the power of attorney and the affidavit of oath from the high court here in Dakar Senegal. I have informed the Reverend about it and he gave me the contact of this lawyer below,he is a registered lawyer in the United Nations Camp here and he is also a registered member in (Senegalaise Bar Association) who will help in preparing the documents for us. Please i will like you to contact him through email and phone today,when your contacting him, tell him that you are my Foreign partner and you want him to prepare a power of attorney in your name to enable the tranfer of my (Late) father's ACCOUNT in ROYAL BANK OF SCOTLAND to the account in Your country. So, i will like you to contact him for the preparation of the power of attorney on your name,Please try and contact me when you are in contact with him and let me know if he agrees to help us!. Please i will like you to first of all get the money transfer and when you come here we all can move at the same time.I will be waiting for you soon Honey to hear your sweet voice today. I am feeling for you every minute of the day ,i wish to be with you soon. I have attached for you here my late father's Death certificate Please contact our Lawyer, so that he will prepare the rest as the Royal Bank of Scotland instructed soonest.Please don`t forget to send me your pictures in your nest mail after calling or mailling this Lawyer we have, untill this transfer take place into your account. SEQUEL TO YOUR MAIL WHICH WE RECEIVED TODAY IN MY NOBLE LAW FIRM ON HOW TO GET A LETTER OF AFFIDAVIT AND PREPARE A POWER OF ATTORNEY IN YOUR NAME FOR YOU TO STAND ON BEHALF OF YOUR PARTNER MIS EDITH GODWILL AND TRANSFER SOME MONEY INTO YOUR ACCOUNT. MY NOBLE LAW FIRM WISH TO BRING TO YOUR NOTICE THAT BEFORE WE CAN PROCEED WITH THIS SERVICES, WE WILL WANT YOU TO FORWARD TO THIS LAW FIRM IMMEDIATELY YOUR FULL CONTACT DETAILS (YOUR NAMES AND ADDRESS AS YOU MAY WANT IT TO APPEAR ON THE POWER OF ATTORNEY AND THE AFFIDAVIT OF OATH ). MEANWHILE YOU WILL SEND TO US, ( 168,000 CFA WHICH EQAUL TO 490 US DOLLARS ) FOUR HUNDRED AND NITHY DOLLARS ONLY FOR OUR CONSULTATION AND LEGAL PROCESSING FEE, YOU HAVE TO SEND THE MONEY VIA WESTERN UNION MONEY TRANSFER WHICH IS THE FASTEST MEANS OF SENDING MONEY IN THE WORLD, SEND IT WITH MY NAME AND ADDRESS BELOW. YOU ARE TO SEND THE MONEY TODAY, SO THAT FIRST THING BY TOMORROW MORNING, I WILL GO TO THE FEDERAL HIGH COURT HERE TO ASCERTAIN THE COST OF THE AUTHENTICATION OF THE POWER OF ATTORNEY AND THE AFFIDAVIT OF OATH BEFORE IT BECOMES VALID FOR THE TRANSFER OF THE MONEY TO YOUR ACCOUNT. AFTER WHICH MY LAW FIRM WILL CONTACT YOU BACK WITH THE REQUIRED COST AT THE FEDERAL HIGH COURT BEFORE ACCEPTING TO RENDER THE REQUIRED LEGAL SERVICES. ADD YOUR PHONE NUMBERS FOR BETTER COMMUNICATION.